Sue Barker hosts the lighthearted sports quiz. Joining captains Matt Dawson and Phil Tufnell are Libby Clegg, Ryan Sidebottom, Iwan Thomas and Clinton Morrison. We've got four fantastic guests joining our captains tonight. and England fast bowler, Ryan Sidebottom. and Ireland international striker, Clinton Morrison. We are starting with a one-minute round and, Phil, you're up first. -Just shout it out, boys. -60 seconds on the clock to get through as many as you can. at the last two Olympics? Gold and silver in the men's 400 at the last two Olympics? if you bent the wire of the lipstick? Oh, wow. Wire of the lipstick? With which sport would you associate this piece of music? -Yes! No, motor racing, F1. Which manager guided Bournemouth to promotion from the championship? for the last time in 1986? from the names of these American sports teams? I knew it was snooker. The baseball was the Astros. And in the NBA, it's the Houston Rockets. Oh, of course it's the Rocking Rockets. -Lipstick, bent the wire on the lipstick was darts. I didn't know that. Bent the wire! Well done, you scored six, so that's a good start. -Not bad, we'll take that. OK, just shut them out, shout all the answers out. I'm going to be rubbish. No, you're not, come on, more positivity, please. in last season's one-day cup final but was on the losing side? over what distance is the longest race in the pool? Which Premier League football team walk out to this music? Which American won the men's T11 Paralympic 100 metres gold in Rio? -Have a think about it. Move on, but keep thinking about it. In the list of 2016 Olympic sports, which came last alphabetically? have won the last two Challenge Cup finals? to win the men's Olympic handball gold? -Oh, that's not an R, that's a W.
And the Paralympic 100 metres gold was won by David Brown. -So, you knew that, didn't you? -You knew that. You said Richard Browne. Richard Browne, he's... He races Jonnie Peacock. -You could have just said Brown. Oh, is it? Fair enough, fair enough. Matt in front on seven. Matt, your team are going first in this round. Make sure you listen closely as the questions will follow. Bolt just getting into his stride alongside Gatlin. And here comes Usain Bolt. He's going to win the gold. 9.64, the champion becomes a legend. The drive to the line must succeed. It has, indeed, for Giampiero de Carli. Their first-ever try in the Six Nations championship. Kasprowicz, the man to go. It's Don't Push It, Tony McCoy. At the 15th attempt, he wins the Grand National. Don't Push It is the winner. Now, you heard four pieces of commentary. Put them in chronological order from oldest to most recent. Six Nations, 2000, Italy's first try, de Carli. Does that make sense? 3000. Don't Push... No, Crammy. Crammy, Bolt! "The champion becomes a legend." How many did he win? How many...? Was it three Olympic titles? I'm trying to think when that was, though. -The champion becomes a legend! Would Steve Cram have said, "Champion becomes a legend"
in his first Olympic gold? because I don't think he ran that quick in Rio. -I don't think he ran as fast in Rio. I think he ran slightly slower than that, but I can't remember. Right, so we need to work out whether AP was before or after 12. -So, you want the oldest first, did you say? Rugby, cricket, horse racing and Usain Bolt running the 100 metres. OK, this is the order they should be in. Now the drive to the line must succeed. their first ever try in the Six Nations championship. Bolt is just getting into his stride alongside Gatlin. and here comes Usain Bolt. He's going to win the gold! The champion becomes a legend. You got all four points. -Now, Phil, your turn. Are you ready? Game, set and match, Federer. Just when he looked injured and out of it, he equalises for Liverpool. and try to whack it out there, no. No, no. That would be totally ridiculous. What a break! What a fantastic maximum break that is! Five minutes for a maximum. -Ronnie, yeah. When did he do that? when it was taking place, and put them in chronological order. -It's got to be at least 2006. -It's a few years back, I'd say. -Yes. That wouldn't be a bad shout. Yeah, that's his first win. -Was West Ham. That was a Cup final. -It's got to be ten, hasn't it? Yeah, about 2010, I'd say. He took his shoe off, tried to hack it out. -I've got to think how old I am now! You're strong with six for Roger Federer, 2006? -So, oldest to most recent? Will you give me the four? -We'll go with that, then. This is the order it should have been in. What a fantastic maximum break that is! I've never seen anything like that - Five minutes for a maximum. and try to whack it out of there, no. No, no, that would be totally ridiculous. Should I whisper the scores? At the end of the round, Phil's on six, Matt in front on 11. I'm just keeping my away questions handy. It is Home or Away. Libby, coming to you first. and then won silver in both the 200 metres and 400 metres in Rio? -What was there to worry about? Well done, Libby. Great stuff. Well done, Libby, yeah. Iwan, Home or Away? -It's going to have to be away, isn't it? -Come on, let's have it. If you're there, you're going to go to Australia. Go on, then, we'll have a bit of Oz. You can steal a point. Australia was your right answer. Yeah, Australia and Malaysia, I thought we had that. On the list will be Bahrain. OK, we'll go with Bahrain. And you get a point, yes, well done. Bahrain was the third one. And the other one, China. -China, we were looking for. -Bahrain was a good shout. -Ryan, back to you, so home question or away? -You love them, don't you? and last season became his county's all-time leading wicket taker? This year he became the all time leading wicket taker for Durham. -There can't be many of those knocking about. For Durham. Yes, you are right, well done. -I want to go home but I'm not allowed. -I've been told I've got to go away, so away, please. at the Commonwealth Games in Glasgow? -It is at the Commonwealth Games. Do they play at the Commonwealths? Yes, shooting. We're going to get it. No sailing. Just go through all the different sports and I'll tell you. -Yeah, it was. It might have been. That was hard, wasn't it? Squash was hard. Very well done. Three points scored. we asked some QS viewers to help us fill in the blanks. You have to work out the most popular answers. the top answer from each sport, so only one person from each sport. Matt, you have got Mark blank. Who are the three sports stars you are going for? Mark Ramprakash? Oh, go on, bring up an old scar! Bring it up, why don't you? I like Mark Webber, don't know why. Mark Spitz. I mean, he's one of the greatest ever. -Oh! How have I not remembered him? -So, Mark Selby is going to be one of them. Mark Hughes, Lawrenson, O'Meara, Webber. Then you can go Ramps, can't you, cos of his dancing? -Just cos he got his chest out. -Very popular with the ladies. -A lot of ladies liked him. -With his fake tan all over the place. -We've got Selby. Mark Hughes. -one of the most famous Marks there is. -We're going to go Mark Hughes. Go on, you know you've got to say it. No. What would you go with, Libby? -No. No, don't go with what I say. Number two? Look away now, Daws. And to complete the line-up? -So, here's a chance to really catch up. Jamie Vardy, that's definitely got to be up there. Remember, you can only have one from each sport. Oh, one from each sport. Who's bigger, Vardy or Carragher? -Very good. Yes, he is. -I think that's a good shout. -Murray is a good shout. Yeah, cos that's tennis. We've got one from tennis. Which football would you go for - Vardy, Carragher or Redknapp? I think Carragher is massive and Redknapp is massive. so I think it's out of those two. I don't think it's Vardy. There's got to be more Jamies. -Got to be more. Come on, audience! -OK, let's have a look from the bottom. -I bet this is Carragher! -I bet it's Vardy after all this. -I ruled him out straight away. I cannot believe it. At the end of the round, Phil is on 11 and Matt in front of 14. OK, Matt, we're starting with you in this round. You'll be pleased to know, we are giving you ten points. The test, however, is to see how many of them you can hold on to. -I will ask a question. For every one you are out, a point will come off your total. Here's your first of three questions. been held in the UK? We've had Edinburgh, back in the '80s, that was. -That was before I was born! OK, where else? Has...? Question mark. Has London had the Commonwealths? Must have done, surely. Right, so we think we're confident with five. If it's been in the same city twice, does that count? Yeah, that would count, yeah. How many times has it been held in the UK? because we're bound to not get one, do you know what I mean? -So we're saying five, but we'll go for six? Yeah? We're going for six, Sue. You're going for six? OK, let's see how many points you've got left. Edinburgh twice in 1970 and '86. Manchester and Glasgow, of course. So, that means you take all ten onto the next question. How many current racecourses in England begin with the letter R? Come on, Hats, help me here, please. Yeah? -Yeah, let's go three, Sue. You're going to go for three? OK.
Once again, how many points will you take forward? -We'll take that, won't we? We'll take that. The two that were right were Redcar and Ripon. in the World Championship final? Would Taylor have been involved then maybe? -He's won seven, probably not seven different. OK, let's see how many points do you take through? You dropped two points out of all that? -You need to be good here. -We need to be spot on. How many medals did Great Britain win at the 2014 Winter Olympics? No, definitely nothing in skiing. Oh, curling, the Scottish girls. Oh, right, yes, good work, two. No, hang on, the snowboarding girl. Oh, good shout! Yes, that's right. So snowboarding, Lizzy Yarnold, the curling team. -Did the men's curling get anything? -Three for definite. Three, I can account for. Daws just added one every time and did well. Let's see how many do you take through to the next question. the women's curling and the men's curling. They got a silver, the women got a bronze. Now, how many times did Pete Sampras win the US Open singles title? He won loads at Wimbledon, I know that for sure. He's won loads at Wimbledon. He was a ledge, Sampras. -He's got to have won at least three or four, I'd say. OK. Let's have a look. What a go for a guess! OK, so how many times have Man United won it? With Roy Keane, I'd say three or four times. I've got a feeling four. Three or four. Six? Is six too many. -Let's see how many points you're left with. -I knew it was higher. -It's a lot closer now. At the end of the round, Phil's on 20, Matt's still in front on 22.
so everything is still all to play for. if you buzz in and get it wrong. Kadeena Cox won athletics gold over which distance in Rio? Yes, it's the right answer. Joe Hart played for which Italian team? Kevin Mayer won gold for France in which event? and darts' Kim Huybrechts? No? an NBA team from Oklahoma share their franchise name? Well done to Matt's team. You did, you had to buzz in, you had to try and guess. Anyway, what a show that has been. and there's a lot of fun content on social as well. But that's it for tonight. From all of us here, goodbye. 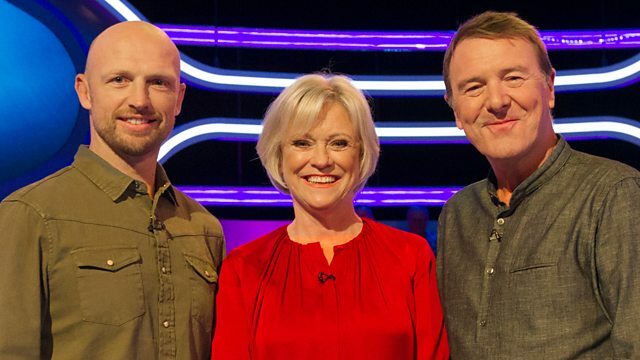 Sue Barker hosts the lighthearted sports quiz with team captains Matt Dawson and Phil Tufnell. Joining the teams are Paralympian sprinter Libby Clegg, former England cricketer Ryan Sidebottom, 400m star Iwan Thomas and footballer Clinton Morrison.